PhilaPlace - Corner of building at 1501 Germantown Avenue (Al-Aqsa Islamic Society), being prepped for the Doorways to Peace mural. 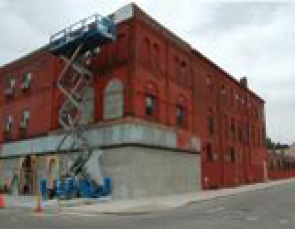 Creating the Mural, "Doorways to Peace"
View of the corner of the building at 1501 Germantown Avenue before Al-Aqsa Islamic Society and a team of artists created the Doorways to Peace mural in 2004. The building was formerly a furniture warehouse.